I have had an incredible burst of inspiration while looking at my books their recipes that I just ran loose around my apartment kitchen whisking and whipping and piping and writing recipes on random sheets of paper that I have around here...somewhere, I think. I have been a very busy girl, actually. I turned 30 on Valentine's Day, alright 31but February was filled with a lot of really cool stuff for me and I have felt very blessed. As a birthday gift, my fiancee got me a seat in a food writing workshop that inspired some new ideas for our cookbook. After, I had a drink with a friend that I had since high school who a few years ago reached out to me about my experience in culinary school. I had her come work with me at a restaurant I was working at and shortly after she had attended and graduated from culinary school and found a job at a bakery, baking bread. Bread requires a completely different breed of culinary professional (one that is not me). But I can certainly eat it. 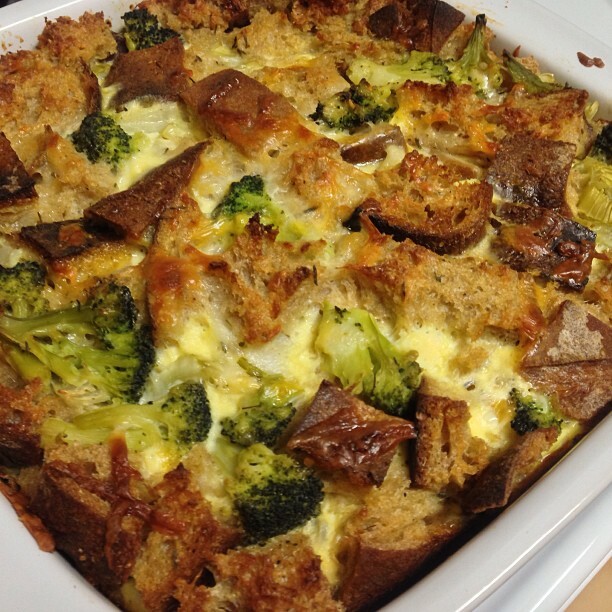 She brought me a few loaves and I made with one of them a Broccoli and Cheese Strata. I got the recipe from Brunch! by Gale Gand. Basically, I had this loaf of delicious hearth bread and I made savory bread pudding and it was definitely savory and a very hearty meal. If I'd had some in the fridge, I would have topped it with some goat cheese. ﻿I bought another book this month too. 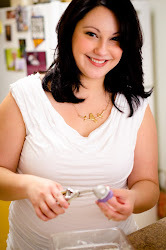 Little Paris Kitchen by Rachel Khoo. I had my parents over for breakfast on Sunday, and I made egg white omelettes with hollandaise. It was a delicious breakfast and I think what made it really special was the toast we made right before we started eating for Teresa and my 8 year anniversary. Love. Somewhere in between all that, I developed a recipe for Vegan Chocolate and Peanut Butter Pudding. It certainly does not taste like its made from silken tofu and it is as delightfully rich as any chocolate pudding. 1. In a small food processor, pulse 7.5oz of tofu and slowly add the melted chocolate. Continue to process until it is completely smooth. Spoon into bowls. 2. Create a layer over the chocolate with the apricot jam. 3. In the same processor, combine the remaining tofu, peanut butter and honey/sugar (or both) and process until smooth. 4. Top the apricot jam with the peanut butter pudding. Dust with cocoa powder. I am kind of behind with this project, but I hope you enjoy this recipe. Try it. Its delicious. WOW!!! This recipe looks amazing!! Can't wait to try it! !